Should we worry about today’s weakness? On Tuesday the S&P500 plunged in the biggest selloff in months. As expected, volume was elevated as some owners used this opportunity to lock-in profits. There was no clear headline driving this selling and instead it was a natural release following this month’s overbought condition. The financial press blamed it on rising bond yields, but they’ve been rising for a while, so why all of a sudden the worry? Journalists are paid to come up with a reason even when there isn’t a reason and today this is what they came up with. It’s been one heck of a rally since the start of the year and clearly the rate of gains was unsustainable. No doubt the gains encouraged others to chase prices higher, but there always comes a point where we run out of buyers. 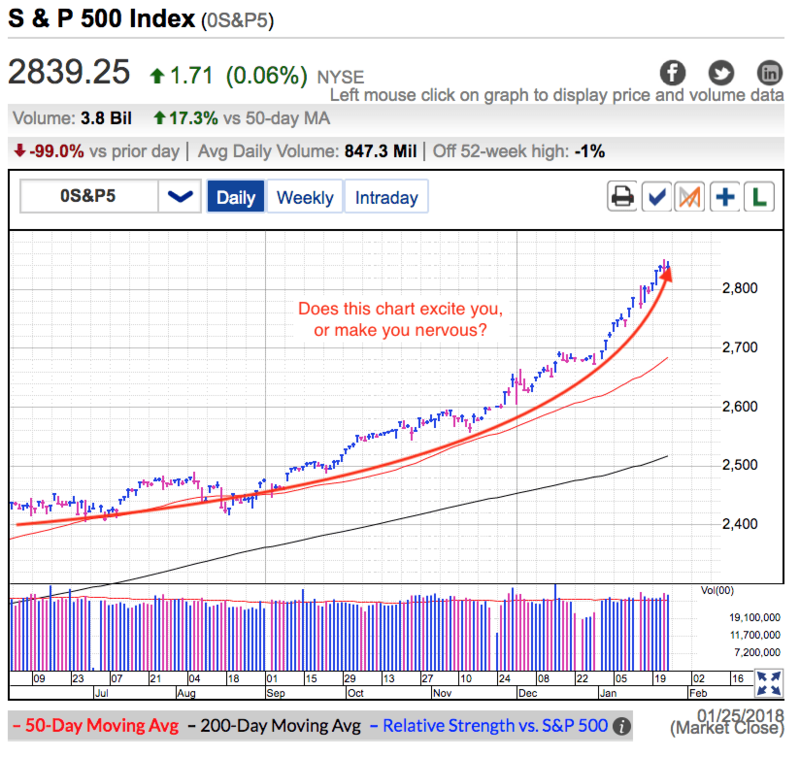 And it looks like we reached that point last Friday when the market surged to record highs. The bigger question is if this is just another routine, buyable dip on our way higher. Or the start of something bigger. The first thing to note is the market hasn’t been blindsided by a scary headline. There is no systemic risk threatening to take our economy down. Instead we topped on good news. Most of this rally has been driven by confident owners refusing to sell. While conventional wisdom tells us complacency is a bad thing, what it fails to mention is periods of complacency last far longer than even the bulls expect. That’s because confident owners don’t sell and the resulting tight supply makes it hard for any selloff to build momentum. Given today’s benign headlines, I don’t expect this weakness to do much to deter confident owners. They held through everything else the market’s thrown at them and this time won’t be any different. What could be different is the lack of dip buying. Previously we would bounce within hours of a selloff and finish the day well off the lows. The last two days that hasn’t happened. That means demand is becoming an issue. Not a surprise given how much buying has already taken place this month. At some point this unsustainable climb had to run out steam and this appears to be that point. But the thing to remember about natural swings in the market is they tend to be benign. That’s because we don’t have a spooky story of doom and gloom making the rounds. Traders are most definitely concerned about this weakness, but so far there isn’t anything to make them change their outlook. This is more of a cooldown than the start of a plunge. No doubt the last two days has been shocking given the almost non-existent selling over the last few months. But this is simply the market catching its breath and we are not on the verge of collapse. Confident owners will remain confident and it won’t take long for us to run out of supply yet again. Tuesday we found support near 2,820. Maybe this is as low as we go, or maybe we slip under 2,800. Either way there is nothing to panic over. Even a dip to the 50dma would be normal and healthy. There is nothing wrong with taking profits at these levels if that is what your trading strategy dictates. But if you are a long-term investor, don’t let a little weakness scar you off. If we get lucky and the market slips to the 50dma, that would be an attractive entry point. But most likely we will run out sellers long before then. I wish I could be as positive for Bitcoin. Prices slipped under the psychologically significant $10k level for the second time this month. This selloff is now more than a month old. If anyone was tempted to buy the dip, they already did. BTC bulls loaded up on the “discounts” earlier in the month and now they are fully invested. Unfortunately their buying wasn’t enough to prop up the market for more than a few days. Without new money, prices continue to slump. For the last few weeks $10k was a floor for prices and we kept bouncing off support. But the longer we held near support, the more likely it becomes that we break it. And that is what happened today. Sentiment in BTC is getting worse not better. Every bounce fails to go as high as the previous bounce and we keep making lower highs and lower lows. At this point I expect $10k support to turn into a ceiling. Unfortunately for Bitcoin owners, it looks like the worst is still ahead of us. The S&P500 treaded water Thursday, but given Wednesday’s negative price-action, doing nothing was actually a win for bulls. On Wednesday an early surge to record highs fizzled and we tumbled into the red. Normally a reversal from record highs signals a lack of demand and is a great short entry. Unfortunately this isn’t a normal market and we cannot rely on traditional trading signals. Ever since Trump’s election, confident owners have refused to sell every negative headline and any bearish price-action. Conventional wisdom tells us complacent markets are vulnerable to a collapse. What conventional wisdom fails to mention is periods of complacency often last far longer than even the bulls expect. Confident owners don’t sell and that keeps supply tight. It is hard to get a selloff started without sellers and is why it has been ages since any dip went more than a handful of points lower. This is most definitely not a normal market and Wednesday’s negative price-action should have been ignored. Thursday’s flat trade confirmed Wednesday’s selloff was yet another false alarm. In one-way markets we keep doing what is working and here that is sticking with our favorite buy-and-hold positions. That said, this is the riskiest period for stocks in nine years. Risk if a function of height and these record highs mean the risks have never been greater. Everyone loves a market that goes up, but this buy-and-hold-no-matter-what attitude is going to backfire spectacularly at some point over the next 6 to 24 months. Hold all the way up, hold all the way down is the way this works for most investors. But for those of us paying attention, it doesn’t have to end this way. 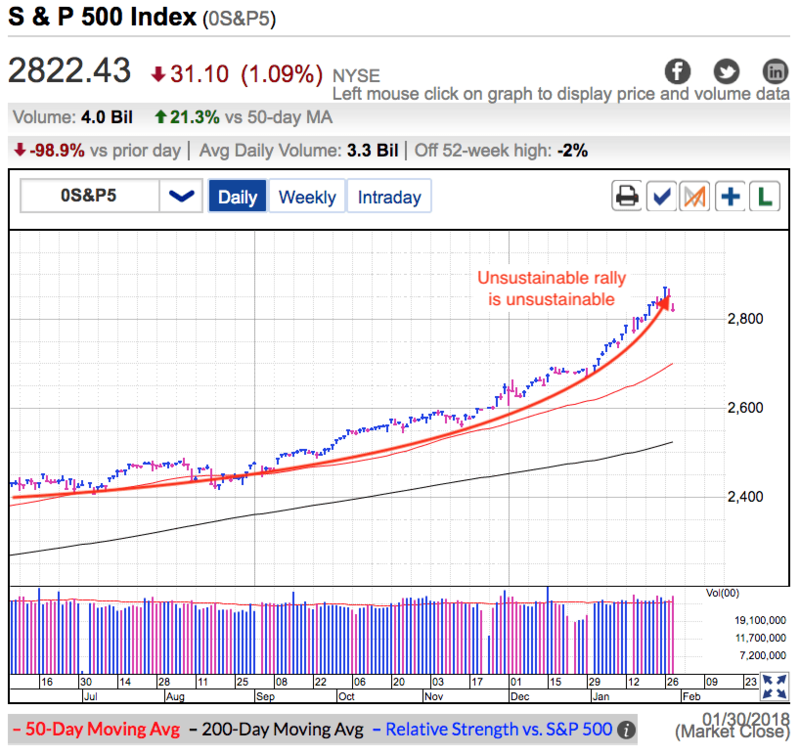 Enjoy this rally higher over the near-term, but stay alert and keep close to the exits. This market has never been closer to topping. Trading is most definitely not easy and without a doubt the market will remind everyone when they least expect it. Currently the stock market is cheering the falling dollar because it makes domestic producers more competitive. What the market is ignoring is the U.S. is a net importer and consumer based economy. A falling dollar means prices in Walmart will go up and that erodes household purchasing power. There is most definitely a half-empty side to a weak dollar and the surge in oil prices is just the start. Add in the Fed’s expected rate hikes and that very well could be the recipe for our next recession. It will take a while for these macro-economic effects to be felt, but it is most definitely something worth paying attention to. While everything feels great, the thing to remember is the top of every bull market always feels great. 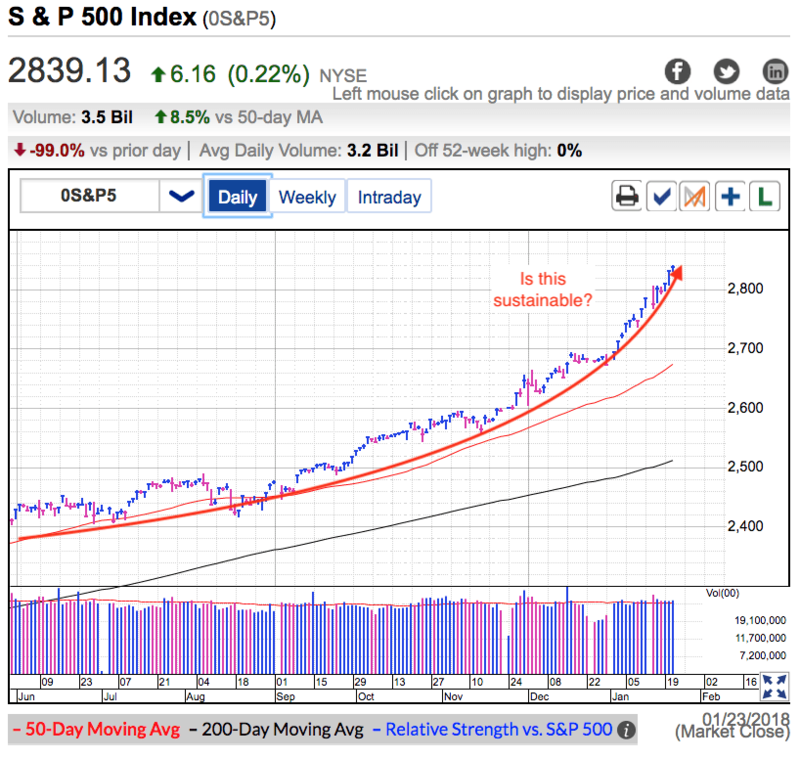 Over the near-term the market is acting well enough to stick with it. But to key to surviving the next downturn is seeing it before everyone else does. On Tuesday the S&P500 finished higher for the 12th time this year out of 15 trading sessions. And honestly, two of those down-days hardly count since the losses were barely more than -0.1%. Clearly the crowd is in a buying mood and few are showing any fear of these heights. The market surged Monday when the Senate agreed to a temporary extension that reopened the government, but there is little reason to think a handful of days will patch the divide between Republicans and Democrats. But this style of all-or-nothing standoffs is typical of political negotiations and eventually a compromise will be reached. The market knows this and is why its reaction to the government shutdown was almost nonexistent. The bigger question is how many more up-days can we string together? Markets go up and markets go down. Except this one. We just set the record for the longest stretch in market history without a 5% pullback. Extended runs occur all the time. Unfortunately most good stretches are inevitably followed by extended moves in the other direction. Only a person who thinks the stock market has forever changed believes this period of prosperity will continue indefinitely. The funny thing about investing is the more expensive something becomes, the more excited people are to buy it. Rather than wait for Black Friday sales, investors cheer Christmas markups. And the recent surge in prices is making the crowd even more excited to buy stocks. This market makes experienced investors nervous, but investing novices are diving in head-first because they are more afraid of missing out than losing money. While the good times last far longer than anyone expects, they almost always end in tears. Enjoy the ride higher, but stay close to the exits. The more greedy other people become, the more fearful we should be. For the time being everything still looks good and this market clearly wants to go higher. We are well past the point of a normal and routine pullback because buyers insist on chasing prices higher. We are long overdue for a dip, but since owners are keeping supply tight by stubbornly holding for higher prices, it will take a fairly shocking headline to dampen the market’s mood. And as we just witnessed, it needs to be a heck of a lot bigger than a government shutdown. Until then, the path of least resistance is higher. But always keep in mind, the higher we climb, the harder we fall.